Ballynure Old Boys had an unscheduled day off on Saturday when their matches were postponed because of waterlogged pitches, but their respective league positions were unaffected. 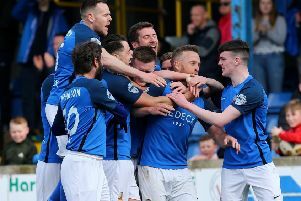 They remain top in the Ballymena and Provincial Intermediate Division with main rivals Newtowne unable to take advantage, owing to their involvement in the Irish Cup. So the Limavady lads remain in second spot, four points adrift, but with a game in hand. This weekend Gary Burns’ lads face a tricky visit to The Diamond to take on last season’s bogey team, Rathcoole, who recorded league and cup victories in local derby clashes. “That was last season,” countered Burns. “They have some team changes this season and we have already thrashed them 7-0 in a league fixture when they came to us away back in August.